Context: A major determinant of the prognosis of oral cancer is the risk of cervical lymph node metastasis. Several factors have been assessed preoperatively to predict the risk of lymph node metastasis; among them, tumor thickness is proved to be a significant predictor of lymph node metastasis. Ultrasonography (US) is a noninvasive, rapid, easily repeatable, and economical examination to measure tumor thickness. This study is undertaken for evaluating the usefulness of US to predict neck metastasis. Aim: To measure tumor thickness in oral cancer with preoperative US and to predict occult cervical lymph node metastasis. Materials and Methods: In all, 43 patients with biopsy-proven squamous cell carcinoma of tongue/buccal mucosa underwent preoperative US to measure tumor thickness. 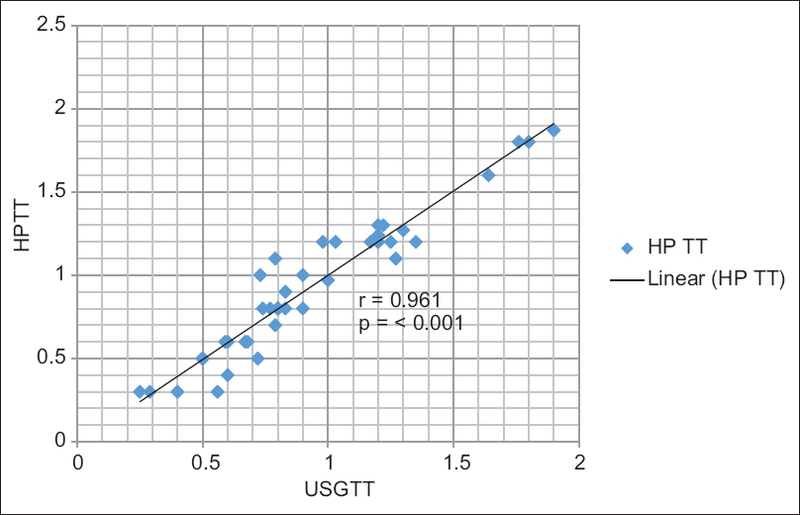 Statistical Analysis: Tumor thickness from histolopathology and US was analyzed using Pearson's product moment correlation. Fisher's exact test was used to assess the relationship between tumor thickness and the risk of cervical lymph node metastasis. Results: There was a significant correlation between preoperative US and histological measures of tumor thickness (correlation coefficient 0.961, P < 0.001). The overall rate of lymph node metastasis was 25.5% (11/43). In the group with tumors <5 mm in thickness, the neck metastatic rate was 0% (0/5), when compared with 29% (11/38) in the group ≥5 mm. There is difference between the two groups, but it was not statistically significant, P > 0.05. Conclusion: Preoperative US is an accurate measure of maximal tumor thickness. Tumor thickness ≥5 mm can be considered as a risk factor for cervical lymph nodal metastasis. Objectives: To look at the trends of risk factors leading to birth asphyxia, in newborns admitted to a peripheral hospital giving tertiary care. Methodology: Descriptive longitudinal study conducted over a period of 6 months (March 2016–August 2016) in babies fulfilling the criteria for birth asphyxia. Variables studied included antenatal care (ANC), period of gestation, place of delivery, mode of delivery, birth weight, pregnancy complication, and time of arrival to hospital. Results: The total number of admission in neonatal unit during the study period was 540, of which 58 babies fulfilled the inclusion criteria for birth asphyxia. The majority of admissions were referred from government hospital (68.91%), and all the mothers were booked and had ANC visits. Similarly, all were full terms except one preterm baby. Caesarean section was performed in 25.8%, and 74.2% had normal vaginal delivery. All were institutional/hospital delivery. The majority (65%) of babies were referred within 6 h, and 79.3% of babies weighed more than 2.5 kg. Conclusion: Birth asphyxia occurring in such a high number of booked cases with institutional/hospital delivery indicates inadequate perinatal services. It is advisable to have trained neonatal resuscitation personnel with all necessary equipments and medications at the time of delivery. Background: High sigmoid (divided) colostomy has been recommended by various studies for the management of high-type anorectal malformation (ARM). It is postulated to be associated with fewer complications. Aims: To compare the complications related to left transverse loop colostomy and high sigmoid loop colostomy done in male patients with high-type ARM and share our experience. Materials and Methods: A prospective study on all male neonates admitted with high-type ARM at our high-volume tertiary care institute from January 2014 to March 2016 was carried out. The patients were randomized and divided into two groups (group A: left transverse loop colostomy and group B: high sigmoid loop colostomy). The patient's clinical presentation, operative course, and complications were recorded. Results: Of 158 male neonates who were subjected to loop colostomy, 93 (58.9%) were in group A and 65 (41.1%) in group B. Mortality was higher in group B (16.9%) than group A (8.6%), but none directly related to the type of colostomy. Intraoperative complications (technical difficulties) such as difficulty in approaching the sigmoid colon with dilated small bowel loops and identifying the proximal and distal parts of sigmoid colon along with handling of the bowel (including serosal tears) were significantly more in group B (20%) than group A (1.07%) where transverse colon was easily exteriorized. The average time taken for the procedure, pericolostomy excoriation, and bowel obstruction was more in group B when compared with group A. Conclusion: Left transverse loop colostomy works well to relieve the obstruction and is less time-consuming, particularly with late presentation. We recommend left transverse loop colostomy in cases of high-type male ARM because of the ease of procedure and comparatively low complication rates. Background: Pemphigus foliaceus (PF) is characterized by shallow erosions with erythema, scaling, and crusting over seborrheic areas of the face, scalp, and chest with characteristic histopathology and direct immunofluorescence (DIF). Aim: To study the clinicoepidemiological profile of patients with PF and response to treatment, especially pulse therapy. Materials and Methods: This was a prospective clinical and therapeutic study of 20 patients WITH PF, attending DVL Department, from May 2007 to April 2016. The diagnosis was made based on clinical features, histopathology, and DIF. Clinical variants of PF were studied, and severity was assessed based on body surface area involvement. 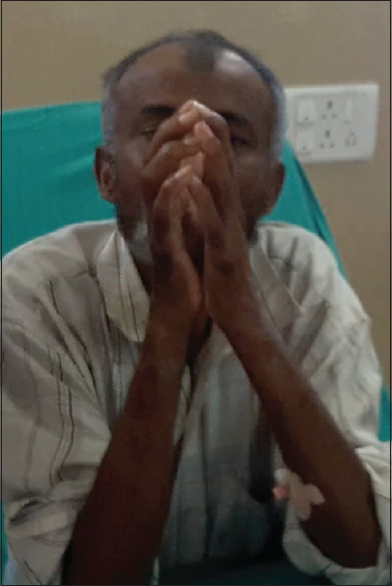 After detailed evaluation, 18 patients started on pulse therapy [13 dexamethasone cyclophosphamide pulse (DCP), 3 dexamethasone azathioprine pulse (DAP), 2 dexamethasone-only pulse (DOP)]. Two patients were not started on pulse therapy for medical reasons. Results: The most common age group affected was 51–60 years. Male: female ratio was 1:1. Clinical variants observed were classical localized – 4, classical generalized – 10, erythrodermic – 4, pemphigus erythematosus – 1, and acral vesiculopustular lesions – 1. Nail changes and small erosion on the inner aspect of the lower lip were present in two patients each. The average time to remission was 7.3 months. Of 18 patients, 14 patients responded well to DCP/DAP/DOP therapy. Two patients lost to follow-up in phase 1. Two patients had frequent relapses and started on methotrexate; the disease is under control in one patient. Conclusion: PF usually localized to seborrheic areas; in our study, generalized papulosquamous lesions and erythroderma-like presentation were predominant. The majority of the patients showed remission with pulse therapy, and two patients require addition of immunosuppressants in the follow-up period. Background: Pustular psoriasis is an uncommon form of psoriasis consisting of sheets of pustules on erythematous background. Treatment depends on the extent of involvement, severity, and underlying risk factors. Objectives: To study the clinical profile of pustular psoriasis, to identify triggering factors, and to study the response to treatment. Materials and Methods: A prospective clinical and therapeutic study of patients with pustular psoriasis attending DVL department over a period of 2 years. Diagnosis was made based on clinical and histopathological findings. Fourteen patients were admitted, investigated, and treated appropriately. Results: Nine were females and five were males. The mean age of the patients was 30 years. The duration of disease was 1–3 weeks. 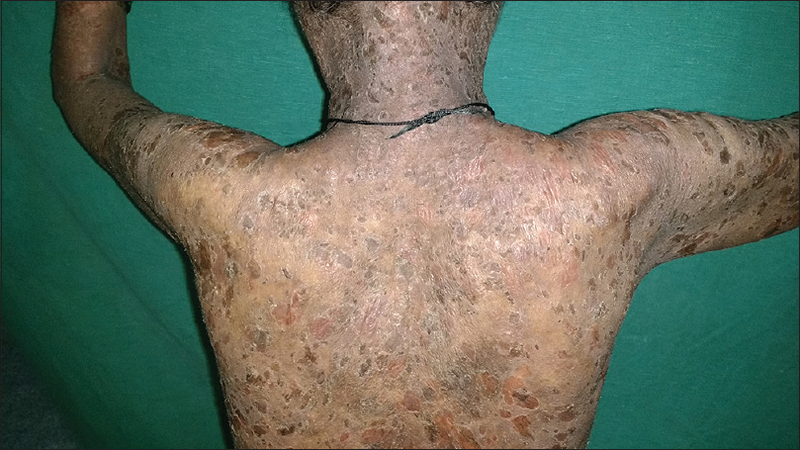 Among 14 cases of generalized pustular psoriasis, 10 were of acute type, 3 were pregnancy-related, and 1 childhood onset. In pregnancy group, all the patients were managed with systemic steroids till delivery followed by methotrexate (Mtx) and cyclosporine (CsA) during postpartum period in two patients, respectively. Eight patients were managed with short course of steroids and Mtx followed by Mtx alone. One patient with tuberculosis spine was managed with CsA and antituberculous therapy. Highly active retroviral therapy and acitretin (50 mg) were given in a retroviral-positive patient. One patient with recurrent episodes improved with antibiotics only. In our study, steroids were followed by maintenance therapy with Mtx/CsA and acitretin accordingly. CsA was given during crisis followed by maintenance with acitretin. Two patients on Mtx and one on CsA therapy with frequent flares were shifted to acitretin. Acitretin showed good response in patients who had frequent flares while on Mtx and CsA. In our study, response with acitretin, Mtx, and CsA was 100%, 57.1%, and 50%, respectively. Limitations: Only small number of patients. Conclusion: All patients were generalized type and showed good remission except one who succumbed to death due to septicemia. Objectives: To detect the presence of Midkine in serum and gingival crevicular fluid (GCF) of healthy non-smokers, chronic gingivitis smokers, and non-smoker individuals and to evaluate the role of Midkine in the progression of gingival inflammation. Materials and Methods: Periodontal clinical parameters examination including gingival index, pocket probing depth, clinical attachment level, and collection of GCF and serum was performed on 60 subjects, categorized into three groups with 20 subjects in each group: Group I (healthy non-smokers); Group II (chronic gingivitis non-smokers), and Group III (chronic gingivitis smokers). GCF and serum were collected from 20 patients of each group. Midkine levels were estimated using the enzyme-linked immunosorbent assay. Results: Midkine was detected in all samples. The results of this study suggest that mean GCF and serum Midkine levels were the highest in Group III and varied significantly from those of Groups I and II. Furthermore, GCF and serum Midkine levels increased proportionally with the progression of inflammation. Conclusion: As the gingival disease progresses, there is a substantial increase of Midkine concentrations in serum and GCF. Since, Midkine levels in the GCF and serum correlated positively with clinical parameters, Midkine may be considered as a “novel biomarker” in disease progression. However, controlled longitudinal studies are required to confirm this possibility. Background: Cashew nut shell liquid contains 90% anacardic acid and 10% cardol. This liquid when comes in contact topically is said to have deleterious effects both orally and systemically. Aim: The present cross-sectional study was conducted to assess the prevalence of oral submucous fibrosis (OSMF) among 600 cashew nut industrial workers in Kanyakumari district. Materials and Methods: Demographic data and tobacco habits were assessed using pretested questionnaire. Ranganathan K clinical grading system was used to examine OSMF. The data were assessed using SPSS version 11.5. Results: The overall prevalence of OSMF among the study population was 0.002%. Conclusion: The observation from this study clearly indicates that safe working environment prevents occupational hazards. Treating impacted teeth is very challenging for an orthodontist. Although canine impactions are common, second molar impactions are also encountered in orthodontics. The fate of impacted second molar depends on various factors such as the degree of its inclination and position of third molars. A case of molar uprighting using a 0.017″ × 0.025″ titanium molybdenum alloy uprighting spring is discussed in this case report. Treatment included surgical exposure and crown lengthening along with orthodontically assisted eruption. Ameloblastic fibro-odontoma is a rare benign mixed odontogenic tumor exhibiting the histologic characteristics of ameloblastic fibroma and complex odontoma. 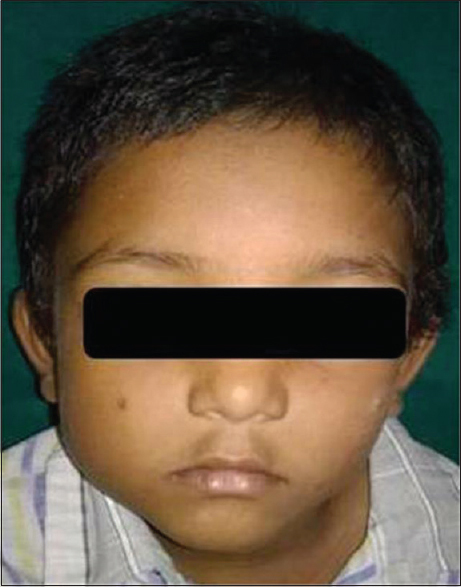 Clinically, it represents a well-defined asymptomatic swelling with deformity of face, and radiographically a well-defined radiolucent area, which contains radiopaque foci of various sizes and shapes. These features overlap with other lesions such as calcifying odontogenic cyst, calcifying epithelial odontogenic tumor, and adenomatoid odontogenic tumor which makes a diagnostic dilemma for oral clinicians. Hereby we report such a rare case in a 7-year-old boy. Boar attack to human is uncommon in India and rarely seen in emergency departments. The usual site of injury in such attacks is lower limbs. 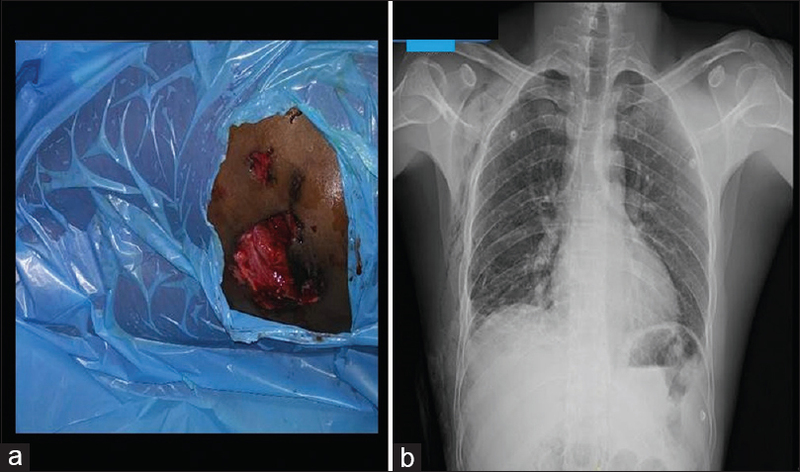 We report a case of a wild boar attack with penetrating chest injury. Lichen planus (LP) involving lips is a rare occurrence. It can occur isolated or with cutaneous or oral lesions. Clinical features include radiated streaks, lace-like papules, and erosions, usually confined to vermilion border. When isolated, it should be differentiated from cheilitis, discoid lupus erythematosus, and other ulcerative conditions. Herein, we report nine cases of LP involving lower lip, with persistent ulceration and crusting. Of the nine patients in our series, eight were females and one was male. Age varied from 25 to 44 years, and the average duration was 4 years. 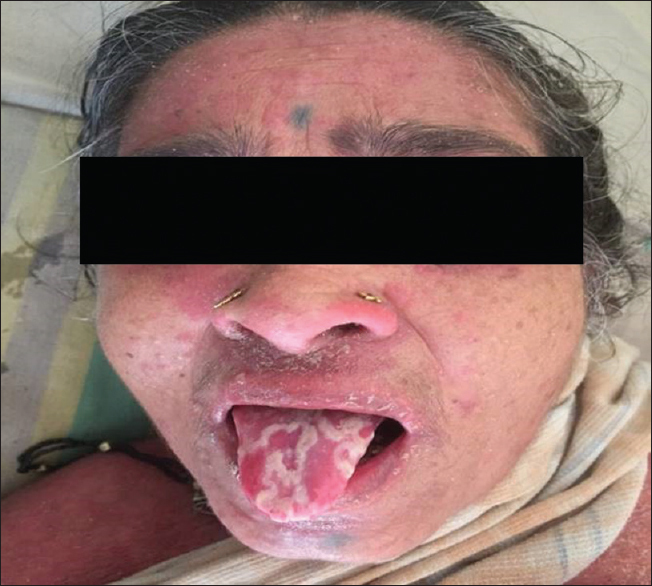 Cutaneous examination revealed diffuse involvement of the lower lip with ulceration, hemorrhagic crusting in eight and localized involvement in one. Biopsy was suggestive of LP with no dysplasia or malignancy. Treatment with topical corticosteroids, tacrolimus, sunscreens, and Hydroxy chloroquine has shown variable results with frequent relapses. Because lesions on the lips are highly susceptible to actinic changes and malignant transformation, these patients require regular and long-term follow-up. Myelolipoma, an incidentaloma, is rarely encountered, especially in adrenal location. Huge myelolipomas are extremely rare and are of surgical emergency. Here we report a 33-year-old male who presented with pain in the right lumbar region with normal complete hemogram and serum hormonal markers. 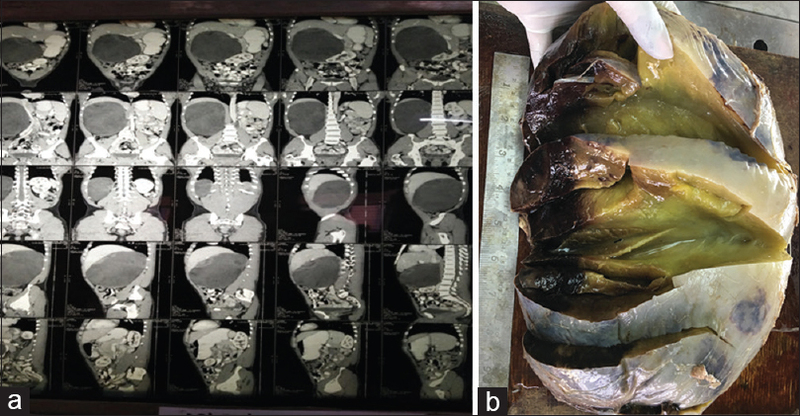 Ultrasonography and contrast-enhanced computed tomography abdomen revealed a huge well-defined homogeneous mass in the right adrenal region which was then removed surgically and histology revealed benign myelolipoma. Myelolipomas are benign and usually asymptomatic. But large lesions may have acute presentation and hence have to be dealt with utmost urgency along with proper imageological evaluation. Ewing's sarcoma is the second most common malignancy of bone among children. It commonly affects the diaphysial region of long bones, while small bones of hands and foot are rarely affected. 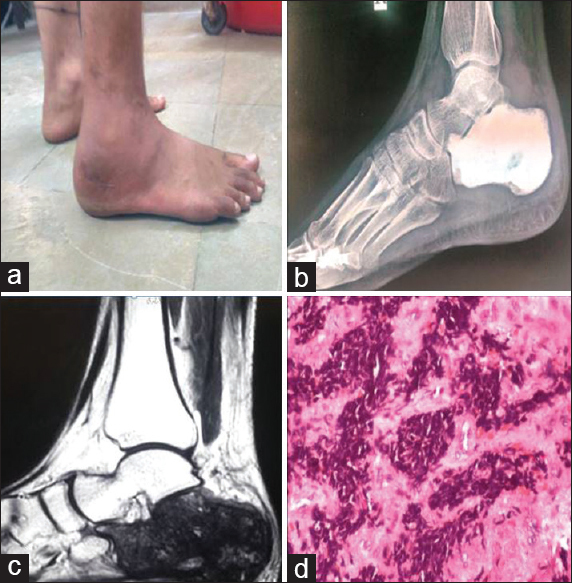 We report a case of calcaneal Ewing's sarcoma which was misdiagnosed as fungal chronic osteomyelitis and treated inappropriately. High index of suspicion is required in diagnosing tumors at rare sites to avoid undue delay in initiating appropriate therapy. 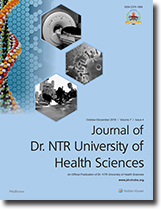 The diagnosis of scrub typhus, though endemic in several parts of India, is missed due to various reasons such as nonspecific presentation of symptoms, lack of knowledge among treating physician, and poor access to diagnostic facilities. We present a case of scrub typhus in a 43-year-old woman whose clinical diagnosis was missed by two other physicians whom she approached before visiting us. A detailed history of social environment and general examination was sufficient to arrive at a diagnosis which was confirmed by the presence of IgM antibodies against scrub typhus. Here, we report a rare case of methicillin-resistant Staphylococcus aureus (MRSA), Cytomegalovirus (CMV), and mucosal Candida albicans coinfection in a post-renal transplant recipient. The patient presented with a cheek ulcer with nasal swelling after 2 months of immunosuppressive therapy following renal transplantation. Microbiological investigations revealed MRSA and C. albicans from the respective lesions and polymerase chain reaction for CMV from blood sample was positive. The patient was subsequently treated with appropriate regimen and is on regular follow-up. A 30-year-old lady with hyperthyroidism for the past 1 year was initially on carbimazole 30 mg twice orally and then changed to 30 mg once daily. She presented with intermittent fever since 3 weeks, h/o oral ulcers, difficulty in swallowing, and palpitations. Routine investigations showed anemia, neutropenia, leucopenia, and C-reactive protein elevation. Peripheral smear showed normocytic normochromic anemia with leucopenia. Widal test, RA factor test, immunoglobulin M (Ig M) dengue, Ig M Lepto, antinuclear antibody screen, cytoplasmic antineutrophil cytoplasmic antibodies, and perinuclear anti-neutrophil cytoplasmic antibodies tests were negative. Viral markers are negative. In addition to the well-known complications such as neuropathy, nephropathy, retinopathy, diabetes mellitus can also result in a variety of rheumatologic manifestations, some of which can significantly affect a patient's quality of life. Diabetic cheiroarthropathy (DCA), which affects the hands clinically, manifests as painless limited extension of the proximal metacarpophalangeal joints and/or interphalangeal joints with spontaneous flexion of the fingers. There is decreased ability to fully flex or fully extend the fingers. This is the so-called “Namaste” or “Prayer” sign. This sign gives an indication of metabolic control of diabetes and microvascular disease. We hereby report a middle-age male patient admitted for fever and was incidentally found positive for this sign. Fundoscopy revealed nonproliferative diabetic retinopathy and there was microalbuminuria. The diagnosis is mainly clinical. It is imperative for clinicians to remember that the presence of DCA carries with it a significant relationship with microvasculopathy. Introduction: The Rogi Kalyan Samitis (RKSs) in Uttarakhand were formed at community health centers (CHCs) to monitor and improve the quality of services offered. Methodology: An independent study was taken up to study the progress made by RKSs in two districts of the state. This article presents the different factors affecting the functioning of RKSs. Data were collected from all member secretaries and at least 20% sampled members in all RKSs in eight CHCs. Results: RKS is not functioning properly in both the districts because of a number of inhibitory factors such as poor interest of the members and lack of awareness among members and the general community. Conclusion: Educational activities about spreading awareness regarding the existence and activities of RKS should be undertaken in those areas where the RKS is not performing well.